Bistro Blackwood's weekly dinner series, Winemaker Waiter, sees local producers in charge of the pours at your table. A well curated wine list is a must for any restaurant looking to rise above the rabble in the eyes of Adelaide diners, but Bistro Blackwood have taken this concept a step further with their weekly dinner series, Winemaker Waiter. Winemaker Waiter happens every Thursday from 6pm at Bistro Blackwood, 285 Rundle Street. Every Thursday night, the venue invites a winemaker onto the floor to showcase their wares, chat, and pour a glass or two. 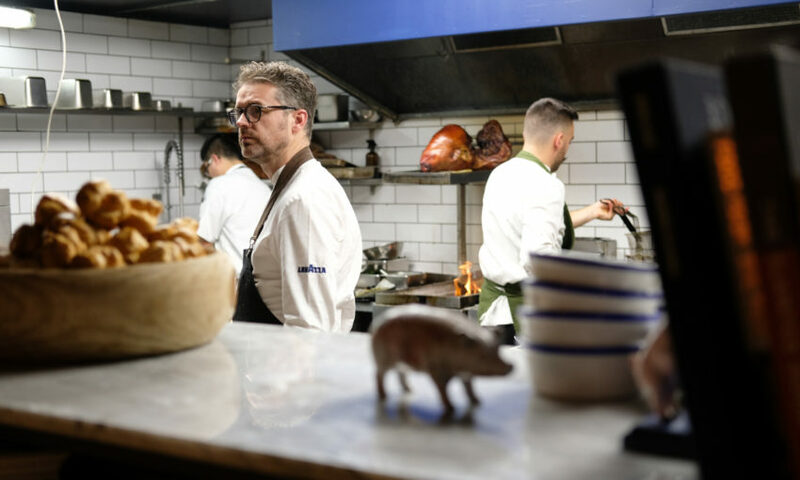 “Originally it was about getting our name out there and getting people in here, but now it’s sort of taken a life of its own, if you like,” Bistro Blackwood’s sommelier, Jonathan Brook says. “The winemaker turns up at about a quarter to six, runs through their wines with our staff, and then they just wander around the floor with their wines. A couple of the winemakers [have] donated tasting stock, so they just walk up to tables and pour wine for people to taste, and then they either sell by the glass or sell by the bottle. 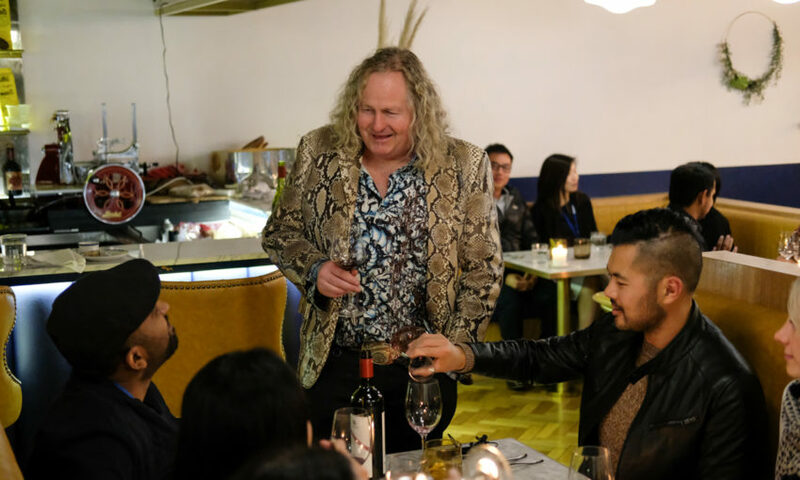 On the night CityMag visits, Chester Osborn from d’Arenberg wanders between tables, stopping intermittently to tell the story of the wine flowing throughout the room. While d’Arenberg has no problem with brand recognition, in previous weeks Waiter Winemaker has made a point of inviting smaller producers in order to give them a platform. “The bigger guys are always going to have a massive marketing department behind them, or they’re going to be able to get their booze into bigger stores, or in the case of Chester, they’ve been around for five or six generations, people know their name,” Jonathan says. “We had a mentor of mine, Gill Gordon-Smith (Fall From Grace) – who’s a mentor of a lot of somms in Adelaide and a lot of wine people – and she came in and she hit the ground running. “Gill’s obviously got a retail front down at Aldinga, but still, it’s nice for her to have a little bit of a presence in the city. So it kind of creates for them an urban cellar door, if you like. The event has also seen the likes of Tom Shobbrook of Shobbrook Wines, Gareth Belton of Gentle Folk, Brendon Keys of BK Wines, and Charlotte Hardy of Charlotte Dalton Wines (“She walked around with a baby strapped to her, which was fantastic,” Jonathan says). Next on the roster, appearing on Thursday, 5 July, is Peter Fraser from Yangarra, and future editions will see Smallfry Wines and Sigurd Wines work the room. Jonathan’s tendency toward smaller producers has meant the series – now up to its 24th iteration – has captured the attention of a “niche wine community,” but Jonathan sees value for a broader audience – those with a casual and a more advanced interest in the industry. “What I would like to see is a lot more wine students and a lot more young people who are interested in food and wine come in,” he says.